My wife and I disagree on whether or not it’s better to eat fresh vegetables or frozen vegetables. I say that frozen veggies are just as healthy as fresh vegetables, but my wife disagrees. Which one of us is right? Both of you. As long as you both are eating vegetables, you are making the right decision. Eating vegetables, whether they are frozen or fresh, is a great idea and a very healthy food choice. In fact, the U.S. Department of Agriculture Dietary Guidelines recommends that you make half your plate fruits and vegetables at every meal. They can be raw or cooked, fresh, frozen, canned, or even dried or dehydrated. The two-year study by researchers from the University of Georgia compared the following nutrients — vitamin C, provitamin A and total folate — in broccoli, cauliflower, corn, green beans, green peas, spinach, blueberries and strawberries in three categories: frozen, fresh on the day of purchase, and five days after being stored in a refrigerator. The study found that in the majority of fresh versus frozen comparisons of vegetables and fruits, there were no significant differences in the assessed vitamin contents. 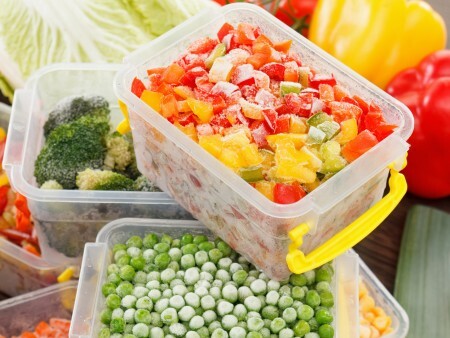 The study also found that in some circumstances, the frozen produce was more nutritious than the five-day fresh stored produce. To help ensure the nutritional content of commercially frozen fruits and vegetables, the produce is processed immediately at harvest to ensure the product’s peak ripeness and to seal in as many of its nutrients as possible. In many cases, fresh produce that is shipped to stores around the country is typically picked before ripeness and is exposed to heat and light during storage and transport, which degrades some nutrients. Also, cooking and preservation exposes the fruit or vegetable to heat, oxygen and light, all of which can degrade nutrient and phytonutrient levels, according to an Ohio State University Extension Ohioline factsheet. No matter what form of vegetable you choose to eat — fresh or frozen — it is important that you choose to eat vegetables. Fruits, vegetables, and their combinations of nutrients and phytonutrients likely play a role in preventing or delaying the development of age-related chronic diseases, like cancer and cardiovascular disease. The 2010 Dietary Guidelines recommends that most people consume 2 cups of fruit and 2.5 cups of vegetables per day. But, according to a 2013 report from the Centers for Disease Control and Prevention, 33 percent of American adults consume less than one serving of fruits and vegetables a day. Fill half your plate with fruits and vegetables at every meal and for snacking. Substitute fruits and vegetables for simple carbohydrates or snack foods in any meal. Always stock frozen and canned fruits and vegetables for quick meal prep. Be sure to choose those without added sugar, syrup or cream sauces. Keep fresh fruits and produce in easy-to-grab places such as a fruit bowl or cut up in a storage baggie or to-go container.